The West Central Ag Finance Department is well positioned to help you make the informed and timely decisions you need to make to keep your operation profitable. To further enhance our finance product offerings we have teamed up with other financial institutions to offer real estate loans, equipment financing and full operating loans. You’ll gain peace of mind when you partner with West Central Ag for your financing needs. Enrolling is a simple process; scroll below to learn more about our finance programs. 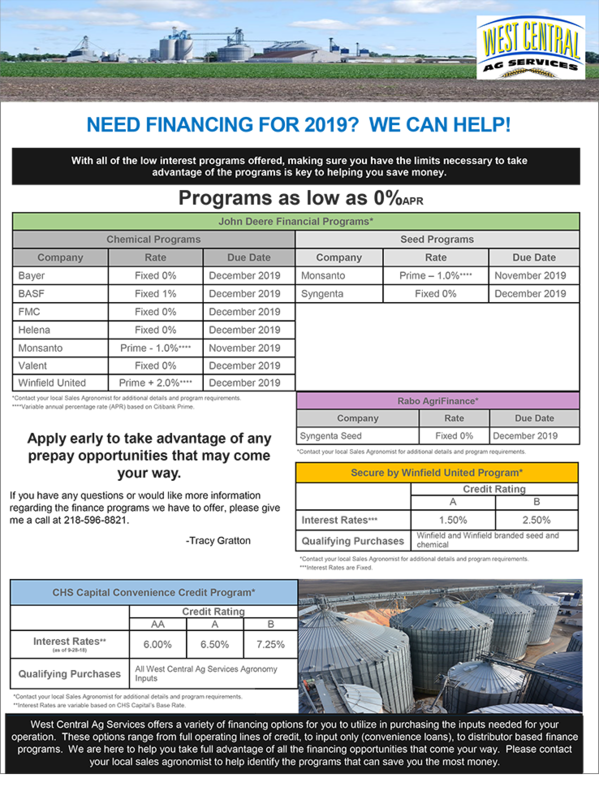 We offer our customers crop input financing through the following programs. Click on a link below to download a PDF application for the respective lender. To further enhance our finance product offerings we have teamed up with other financial institutions to offer real estate loans, equipment financing and full operating loans. Click on the adjacent image for details about the financing options we currently have available. If you have specific questions, click here to contact a member of our finance team.